The air force is heading into what could be a training crisis with all its plans to acquire new trainer aircraft hitting a roadblock and two indigenous programs to develop basic and intermediate training planes missing critical internal deadlines. The air force has painted a grim picture for its trainer aircraft fleet by pointing out that efforts to develop a basic trainer under the HTT-40 program is running five years behind schedule with Hindustan Aeronautics Ltd unlikely to even be certified for flight by 2021 even if there are ‘no uncertainties in development testing’. The air force currently relies of the Pilatus PC-7 turbo trainers for the first stage of training. While 75 of the aircraft were bought under an emergency purchase in 2012, a subsequent plan to acquire 38 more has been on hold as the Swiss manufacturer is facing a probe for alleged corruption in the deal. The other indigenous program to develop an intermediate jet trainer (IJT) is delayed by over 14 years, with all efforts to prove the aircraft fit for service failing. HAL is believed to be entering into a consultancy with a US based firm to rectify the aircraft at a cost of Rs 90 cr. Sources said that the redesign would take a long time, given that the aircraft would need to be certified again – a process that can take up to 5 years. 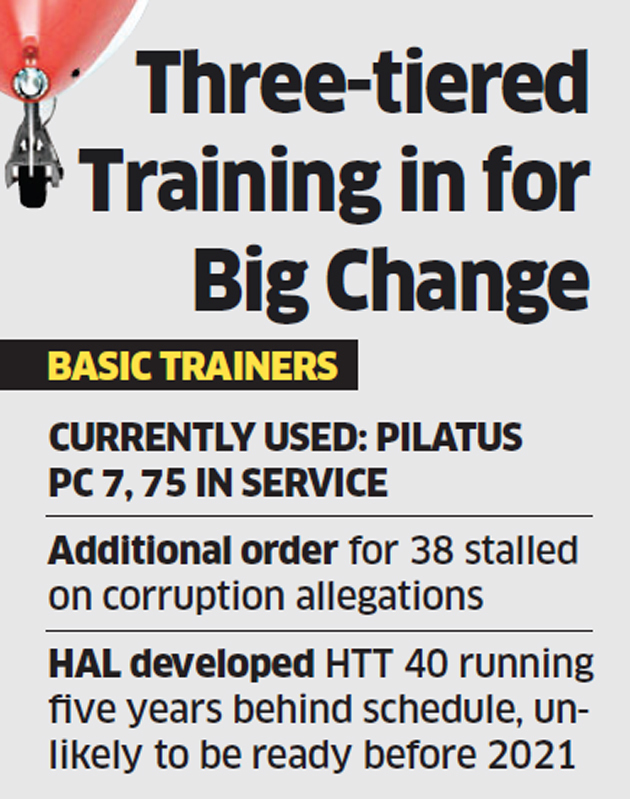 The air force is meanwhile retiring its Kiran Mk 2 trainers that were used for intermediate training, given that the aircraft is past its service life. The Kiran Mk 2s were delivered in 1985. On the third level of training, the air force is currently using the BAE Hawk jet trainers, 123 of which were ordered in 2004 for the air force and Navy. However, an air force projected request for 20 additional planes, along with a possible order for 12 new jets for the Navy has not been able to move forward. The proposal has been rejected by the defence ministry that has contended that the commercial offer by HAL is much higher that what the planes were manufactured by it here earlier were priced at.